A New Template for Joomla! El Shaddai is a combination of two Hebrew words: "El" means God,and "Shaddai" means Almighty. Thus El Shaddai is translated as "God Almighty" (Genesis 17:1 and Genesis 33:11) "El Shaddai" is one of the seven Covenant Names through which God the Father, the Creator of heaven and earth, and of all things seen and unseen, revealed Himself to Israelites, His Chosen people. He is the God of Abraham, Isaac, and Jacob. He is the All- Powerful and ever- Living God Who never changes. He is the same yesterday, today and forever (Hebrews 13:8). He is the All- Sufficient One- "The God Who is More Than Enough." He is the Source and Provider of all our needs, and with Him, all things are possible. To our friends in the Bronx, New York area, you are invited to worship the Lord with us... Sunday School is at 10:30 AM. Sunday Worship is at 12:30 PM. We are located at 1307 West Farms Rd, Bronx NY. Pastor Luis Vasquez is ministering the Word on the Sunday service each week. 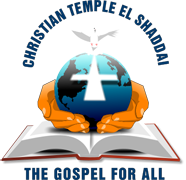 For additional information, please call Pastor Vasquez at (111) 111-1111, or you may call the Christian Temple El Shaddai office at (718) 617-6677.